just one program stops responding? nothing at all responds to mouse clicks or key presses? the mouse stops moving entirely? I have an Intel Bay Trail CPU? In what order should I try various solutions before deciding to pull the power plug? What should I do when starting up Ubuntu fails? Is there a diagnostic procedure I can follow? When a program window stops responding, you can usually stop it by clicking the X-shaped close button at the top left of the window. That will generally result in a dialog box saying that the program is not responding (but you already knew that) and presenting you with the option to kill the program or to continue to wait for it to respond. Sometimes this does not work as expected. If you can't close a window by normal means, you can hit Alt+F2, type xkill, and press Enter. Your mouse cursor will then turn into an X. Hover over the offending window and left-click to kill it. Right clicking will cancel and return your mouse to normal. If your program is running from a terminal, on the other hand, you can usually halt it with Ctrl+C. If not, find the name and process ID of its command, and tell the program to end as soon as possible with kill [process ID here]. It sends the default signal SIGTERM (15). If all else fails, as a last resort send SIGKILL (9): kill -9 [process ID here]. Note that you should only use SIGKILL as a last resort, because the process will be terminated immediately by the kernel with no opportunity for cleanup. It does not even get the signal - it just stops to exist. If the keyboard still works, press Alt+F2 and run gnome-terminal (or, if these fail to launch, press Alt+Ctrl+F1 and login with your username and password). From there you can troubleshoot things. I'm not going to get into mouse troubleshooting here, as I haven't researched it. If you just want to try restarting the GUI, run sudo service lightdm restart. This should bring down the GUI, which will then attempt to respawn, bringing you back to the login screen. First try the Magic SysReq method outlined in Phoenix' answer. If that doesn't work, press the Reset button on the computer case. If even that doesn't work, you'll just have to power-cycle the machine. May you never reach this point. If it locks up completely, you can REISUB it, which is a safer alternative to just cold rebooting the computer. 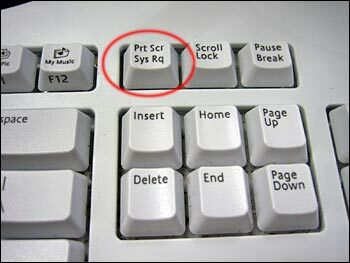 While holding Alt and the SysReq (Print Screen) keys, type REISUB. REISUB is BUSIER backwards, as in "The System is busier than it should be", if you need to remember it. Or mnemonically - Reboot; Even; If; System; Utterly; Broken. NOTE: There exists less radical way than rebooting the whole system. If SysReq key works, you can kill processes one-by-one using Alt+SysReq+F. Kernel will kill the mostly «expensive» process each time. If you want to kill all processes for one console, you can issue Alt+SysReq+K. It will immediately work! You can test this by pressing Alt+SysReq+F. For me, it killed active browser tab, then all extensions. And if you will continue, you can reach X Server restart. More info on all the Alt+SysReq functions here. You can make the shortcut Ctrl+Alt+Delete open the System Monitor, with which you can kill any unresponsive applications. 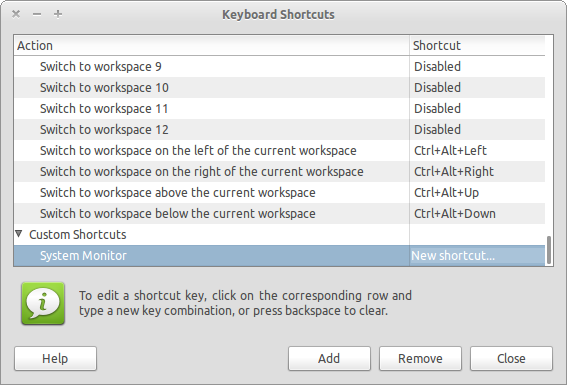 Open up System ➜ Preferences ➜ Keyboard Shortcuts and click Add. 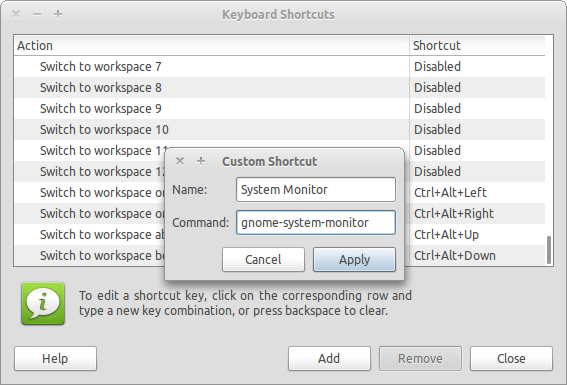 In the Command field, enter gnome-system-monitor. Name the shortcut whatever you want. Freezes such as you have described can be both software and hardware related and as you have found sometimes frustratingly difficult to diagnose. If this is a desktop PC look at your hardware-cards. For both laptops and desktops possibly acpi type issues. It might be useful to temporarily simplify your configuration to have just the graphics card connected with a standard keyboard and mouse. All other cards should be removed. For acpi related issues, try booting with noapic nomodeset in your grub boot option. Its also worth trying acpi=off although this could have other undesirable effects such as constant fan usage. Also worth checking the bios version level and seeing if the vendor has a newer bios version. The readme notes should hopefully reveal if any newer version fixed crashes and freezes. I note you have tried the standard 270 drivers but have failed due to freezes. Can you clarify if you had similar issues with the open-source driver? Obviously you will not get Unity during testing this. If you are willing to try any of the suggestions below first backup your system with a good backup tool such as CloneZilla. You will need an external media device to receive the image such as a large USB stick/drive or separate internal hard-drive. Deactivate (uninstall) your current 173-nvidia driver using the Additional Drivers window. However - I would strongly recommend a backup unless you feel confident on reversing a nvidia install - especially since you had serious issues with the slightly older 270 drivers. I've used clonezilla countless times and it has always got me out of trouble. You do need a large external drive though - USB stick/external drive or a separate drive. The latest graphics drivers have been packaged in the x updates ppa. Note - this will lead you away from the standard baseline - if upgrading in the future ppa-purge the PPA itself before upgrading. To install the 32bit driver (equiv for 64bit) then reboot. If you run classic Ubuntu with effects do you get the same freeze issues as standard Ubuntu? If you cannot reproduce the freeze with classic Ubuntu (no effects) then this will point you towards a compiz issue. I would raise a launchpad bug report with the compiz team. If space is available (e.g. 20Gb), you could dual boot/install alongside the latest oneiric alpha. Obviously this will itself be unstable, but it will come with the latest X and Kernel. You may need to also install manually the beta 280 graphics drivers above since it probably will not be offered in the Additional Drivers window. If during testing you dont see the same freeze activity you could try uplifting your X version with the x-edgers ppa and using kernel kernel 3.0 in Natty. Going this route is not really desirable - and could cause you upgrade issues in the future - and may have other unforeseen stability issue. Again, use ppa-purge to remove the PPA. Kernel 3.0 is packaged with the PPA - you'll need to install the headers as well as the kernel itself from synaptic BEFORE rebooting if you intend to install the nvidia drive later. This is a testing ppa - do have a ready backup if you want to try this route. If you're getting a lot of freezes, there might be something wrong with your hardware. I used to get hard lockups every 48 hours due to some less than optimal RAM. Memtest86+ showed the fault after 40 minutes of testing. Swapped the RAM out for some more (under warranty) and I'm now at 32 days, 1 hour of uptime. Anyway... While knowing how to restart softly is a very handy thing, finding, reporting and fixing the system should be your next priority. If it's an always-on system, you should easily be able to make it between kernel updates* without needing a restart. *You should restart when you get kernel updates as they'll be security fixes that won't be applied until you reboot into the newer kernel. When everything stops working, first try Ctrl + Alt + F1 to go to a terminal, where you can likely kill X or other problem processes. If even that doesn't work, try using holding down Alt + SysReq while pressing (slowly, with a few seconds between each) R E I S U B. This puts the keyboard in raw mode, ends tasks in various states, syncs the disks, etc, and finally reboots the machine. You will get much better results doing this than just pulling the plug. Of course, if this fails, you're pretty much left with pulling the plug. Also, sometimes it's simply the X-Server which hangs - a case I've most often found when you're using Compiz. If this is the case you can kill X, which will restart and drop you back at the log-in screen. At the Key Sequence to kill the X server point check Ctrl + Alt + Backspace. My first favourite when total freeze occured - Alt + SysRq + K.
That combo kills X, and returns me to the graphical login screen. If that doesn't work, try Alt + SysRq + R E I S U B. In such cases you can try CTRL-ALT-F1 to get to a console. Then login with your password. If you're using another display manager, replace ligthdm/gdm/kdm with its name. Fn + SysRq + Alt + K (release Fn after pressing SysRq). Use the man pages for more information about these commands. To diagnose the freezes you should be able to use the net console (or serial serial console for that matter). Follow the set up instructions outlined here. The first thing to look at is if it is just X that's frozen, or the whole system. Enable ssh and then ssh into the system. If you can't ssh into it, then it's probably a kernel lock up. If you can ssh in, then it might be just a gpu lockup. If that works, then it's perhaps an X bug. If it still doesn't work, then you may have a GPU lockup in the kernel drm driver. It would be useful to know at this point whether you're running the -ati (open source) driver, or -fglrx (closed source) driver. use the cursor keys to select the last option "memtest86"
You'll get a basic display and it will try reading and writing lots of values to all of your RAM. As long as there are no failures, you'll see a green status. If there is any failure it will turn red. In that case you'll need to replace at least one stick of your RAM. There is also community documentation of diagnosing hardware failures. If you ever use the magic SysRq key as suggested in the first answer, just try getting the keyboard to work first with Alt + SysRq + R; then try Ctrl + Alt + F1 again. It may work and you may save yourself a reboot. Only if it doesn't work you should try the whole REISUB sequence. Just press Ctrl+Alt+F1 on your keyboard to open TTY1. When it opens, run the Kill command. Example below. accepted as options, and arguments may be job or process IDs. An exit status can be reported using the -l option: zero when at least one signal was successfully sent, non-zero if an error occurred. Using the kill command from /usr/bin, your system might enable extra options, such as the ability to kill processes from other than your own user ID and specifying processes by name, like with pgrep and pkill. Both kill commands send the TERM signal if none is given. I thinks there is no such thing as a perfect distro, even in Windows they have this screen of death. Open another terminal Ctrl + Alt + F2. This restarts or logs you out of your current session but it will not reboot. Then Ctrl + Alt + F7 go get back to your graphical interface. The simplest solution is to add the "Force Quit" applet to your Gnome top panel and when a program doesn't respond, click on the force quit and then on the application. I am surprised with so many answers, this isn't mentioned. Of course, you can always do a ps -A and pipe that to grep for your program name. And kill -9 that. I prefer simplicity. You can always do Alt + F2 and write killall <program> or xkill and click on the window you want smashed! 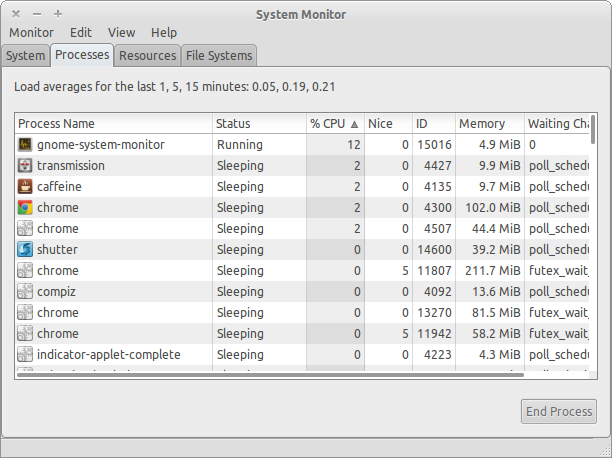 My ubuntu is super prone to freezing (probably 20 odd times a day). I use the magic sysrq key too, but instead of using it to reboot or kill xserver, I use the 'f' command which calls oom_kill, effectively dropping a process. I've only ever seen this drop chrome tabs (as I tend to have quite a few heavyweight ones open at a time). Anyway, this get's me out of this mess 95% of the time. So when my ubuntu freezes (locks up, mouse stops responding etc), I hold alt + sysrq and then hit f (if you don't do this correctly it will take a screenshot instead). I usually have to repeat this combo a couple of times before ubuntu spurs back to life. I'd have given up on ubuntu a long time ago if I hadn't discovered this, hope it helps someone! My particular problem was my graphics card (integrated Radeon 9000 series). netconsole revealed I was getting the error: "reserve failed for wait". After trial-and-error, I manually configured my video card and disabled hardware acceleration. Completely fixed the issue. The following is specific to my Radeon card, but I'm sure other cards have a similar setup. Uncomment "NoAccel" option and set to "True"
You might get some extra information when you switch to the TTY view. Press Ctrl + Alt + F1 to get this, use Ctrl + Alt + F7 (or maybe F8) to get back to the GUI. You can have different sessions on most of the F-keys but that's different question altogether. if possible, try to open an ssh shell from another computer. this is an option If you knew in advance that the computer might hang soon, open the connection first before you perform that task. I do this sometimes when I know vmware runs crazy and the GUI of ubuntu (the vmware host) becomes unresponsive. I can do a suspend from the ssh shell, it might take a while until it gets thru, and after a while the computer is idle again. Hit Alt+F2 to run a command. Type xkill and hit Enter. Your mouse cursor will transform into a cross that can force to close any window you click on. If somebody can provide a screenshot, I think that would be useful. There were some missed bugs between the relation of Unity/Compiz, the X.org system and the Video driver. These bugs of course are dealt with with newer, updated versions of Unit, Compiz, X or the video Driver. When inside Unity and everything is slow and basically damaged, to go to TTY1, press CTRL+ALT+F1. When in the terminal, type your user and password to get to the prompt line. You can also get to the TTY when booting by pressing ESC or holding SHIFT, then on the GRUB menu, selecting recovery mode. This would install the latest version of the 313 series. It fixes MANY video problems with compiz, unity and xorg. The 310 series also fixes many issues but have not tested that one with my video cards. The other Nvidia versions are nvidia-experimental-304 and nvidia-experimental-310 as of this writing. Reboot to test if your video card not works correctly with Ubuntu. If you get any problems regarding Nvidia config file, simply open a terminal and type sudo nvidia-xconfig and reboot. How can I update my NVIDIA driver? What's the difference between the nvidia-current, and nvidia-current-updates packages? Or even one that is more generic: How to correctly enable Desktop Cube in Unity 3D? If you have tried all of the above and the freezing problem remains, you might want to try what I did. Apply generous amounts of contact cleaner to CPU, RAM and any other chip complex enough to show those tiny, tightly packed pins. They can lose conductivity from dust accumulation as well as shorting due to humidity. Some days after the cleaning (I used CRC 2-26) and a series of really brutal stress tests, my PC hasn't frozen once. So, for all of you getting sudden unexpected freezings, give up messing around with your OS beyond what's reasonable and do an exhaustive dust and contact cleaning. Replace with the latest Linux kernel 2.6.35 or up that will solve your problem. Follow these steps from this link. I was having similar issues with 10.04. X would hang and and nothing but a reset would fix it. I updated my nvidia drivers to the latest version and I haven't had issues since. Virtualbox may make your 32-bit host randomly crash when you run a 64-bit guest on it using VT-x or AMD-V (hardware virtualization technology built-in your CPU). It is a known issue. You have to switch to Ubuntu 64-bit as host (you can even perform a 32-bit to 64-bit "migration" by reinstalling Ubuntu 64-bit without touching to your "/home" folder) [recommended if you have 2 GB of RAM or more]. Please note that you can run 64-bit and 32-bit guests on a 64-bit host using Virtualbox without any problem. What do I do if Ubuntu 16.04 freezes, but I can move only the mouse? How to deal with a frozen screen? Why does my USB mouse seem to randomly quit working? How should I deal with bugs that are for unsupported versions of Ubuntu? What to do when ubuntu freezes completely?